I like to think that I studied dance in its classical age. You went to the studio. You took classes. You wore a leotard and tights and maaaaaybe a ballet skirt if your teacher was feeling generous. You had a recital. You FINALLY got on pointe and were thrilled to brag to all your non-dancer friends about your blisters. When people asked what sport you played after school, you smartly answered, "dance." 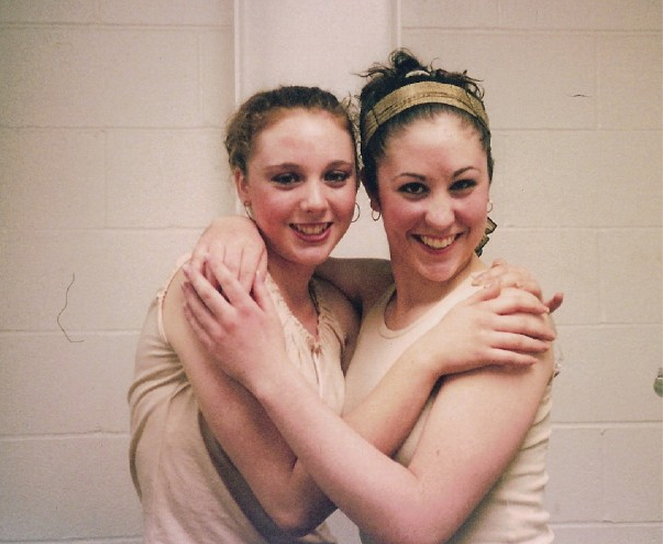 It was toward the end of my high school career that competition dance was settling into place. As a retired cheerleader, I knew the thrill, I knew the drill. It was novel to take our recital dance from last year and get a trophy for it! We were no longer a class, but a team, and we had prevailed over the adversaries! 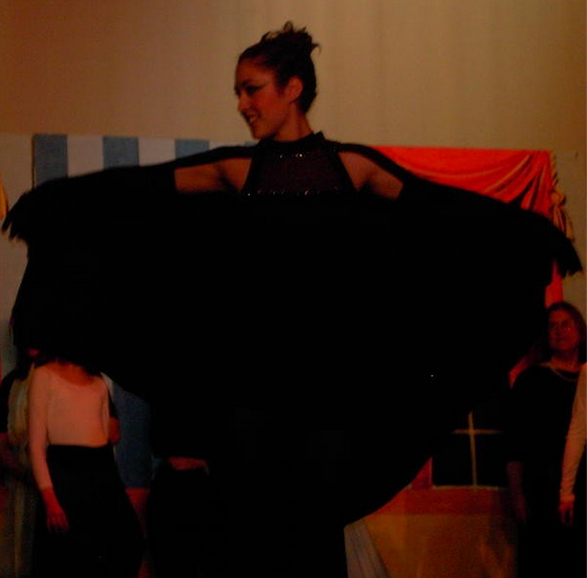 Still for me, my favorite part of dance was that, well, it wasn't a sport. There were no statistics. There were no teams to beat. Aside from the snarky looks you'd get from the super trinas when you fell out of a double pirouette, dance class was not a competition. This photo is from 2003. My dear friend Kate is currently minutes away from having her PhD. I'm sure if they saw her performance in "The Gods Love Nubia" Berkeley would have given it to her on arrival. Here's what you might not know about me. I started dancing when I was thirteen years old. True, I took ballet and tap as a tiny tot but my family moved and we never found a dance studio in time to continue lessons. I stayed busy. I became one hell of a pee-wee soccer goalie, which I no sooner left behind to focus squarely on being captain of my pop warner cheerleading squad. It was only after going to a friend's dance recital in seventh grade that I was like, "oh yeah! that's what I'd like to do!" So maybe that's where my disinterest in competition stems from. The fact that the formative years of my dance career were spent playing catch up to the "older girls" at my studio, who were all actually around my same age. I was in a constant competition with myself. To do better than I had the day before. To learn all the things in a few weeks that those other girls had learned over the course of a few years. To prove that just because I was untrained didn't mean I was bad. TO DO GODDAMN PICKUPS ACROSS THE FLOOR. And that was enough competition for me. I didn't need rhinestones down my part or matching jackets with our names on the sleeves to feel like I was a part of something. Because at the end of a class, at the end of an afternoon of classes, I knew that I was improving, and that I was doing something cool. It felt good to make progress and to keep up with combinations and across-the-floors. It felt good to dance. AND SO FINALLY, we grow up and go to college and we dance around Boston and aside from Dance Moms and SYTYCD and little girls in two piece leotards with 12-pack abs and tilt kicks, THE COMPETITION IS FINALLY OVER. In college, I even made a dance about it. It may be just me. I hope it's just me! It's probably just me, but I feel like there is a lingering tension hanging over the Boston/Cambridge dance scene. We like each other's Facebook pages. We follow each other on Instagram. We share smiles when we pass each other between rehearsals. WE ABSOLUTELY SUPPORT DANCE IN BOSTON. How often do we go to each other's shows? Do we ever attend each other's open classes? When do we go to classes anyway, not just our own cloistered rehearsals? Yes, yes, of course, we're all SO busy and we'll try SO hard to make it to the next one, just make sure to tell me in advance when I can get tickets. How often do we actually watch each other's videos just to see what we're all up to, instead of comparing our choreography, our styles, and our skills to whomever we're watching? CAUTION: I'm about to be brutally honest. I think that deep down, we're all a little afraid to see each other really succeed, for fear that someone else's success will detract from our own. Like there is a finite amount of love and appreciation for dance in this city, and we're all clamoring for it. And anyway, if Ailey is in town, we're all screwed. Hell, if Ailey is in town, we'll all probably be in THAT audience. Boston is not a major dance city. Suburban ballerina babies get Nutcracker tickets in their Christmas stockings every year. (Riverdance, if you're me.) The incredible break dancers at Faneuil Hall draw tourists that marvel at something so modern happening on such hallowed historical ground...cobblestones, no less! Our favorite Disney musicals come to life every February...on ice! And kudos to us! We're still making dance. We're still dancing. Dance is still our priority. We should be celebrating each other, not scorning each other. We should be supporting each other. A daunting task when we're trying to support ourselves, but is there not strength in numbers? We should actually and actively invest our interests in each other. It's possible to learn from each other without stealing ideas. It's possible to inspire each other, without taking away from our own vision. It's possible to watch a company that is similar to yours and enjoy their show. 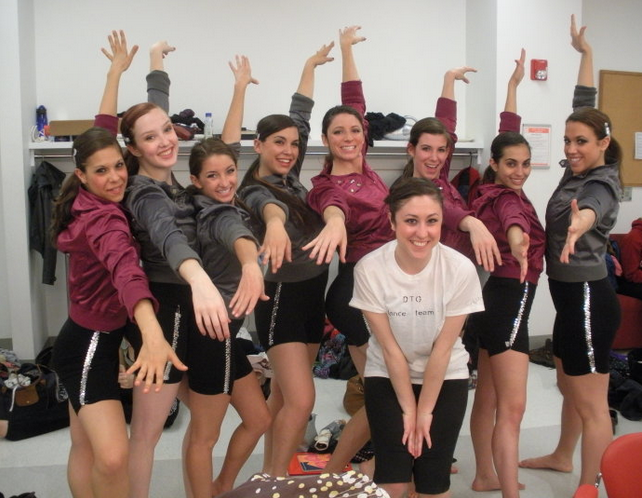 It's possible for a white girl from Connecticut to dance in a Haitian troupe. It's possible to make dance for dance's sake, and it's possible to enjoy dance for dance's sake. And yes, some competition is innate. We use the same performance venues and rely on the same rehearsal spaces. We're vying for the same grants and similar audiences. We all want listings in the same event calendars. We know each other's technical strengths and weaknesses because WE ALL KNOW EACH OTHER. Guys, we ARE the Boston dance scene. So let's be proud of each other and ourselves. Let's be friends instead of rivals. Let's make recommendations and mean them. LET'S GO TO EACH OTHERS SHOWS WHEN WE CAN. We all love to dance, we all just want to dance, and none of us is intending on preventing each other from doing that. If we foster a culture of love and support and positivity within our dance community, we will grow and expand. Our audiences may not be so predictable. We may start selling out Monster seats. Who knows, maybe we can even get matching jackets with our names on the side. Merde, everyone. And I mean it. In 2005, we didn't even part our hair!